Since the debut of the first iPad in April of 2010, Apple’s flagship tablet has been the gold standard by which all other tablets are judged. The new iPad Pro aims to keep that technological winning streak alive. Bigger and more powerful than ever, the iPad Pro clearly demonstrates that Apple’s willing to put out a beast of a tablet if that’s what the public demands. In the looks department, the iPad Pro is basically a carbon copy of preceding models. At 7mm in thickness, it’s nearly as svelte as the iPad Mini despite its weight of 713 grams. The 12.9-inch LED screen features a 2,732×2,048-pixel resolution good for 264ppi. An oleophobic fingerprint-resistant coating and an anti-reflective layer make for painless reading in any environment. Dual microphones and impressive stereo speakers round out the chassis nicely. The newest iPad Pro sports the 64-bit dual-core 2.26GHz A9X chip, which includes an M9 motion co-processor. That beefy silicon is backed up by 4GB of RAM and up to 128GB of on-board SSD storage. Ports are limited to a headphone jack, a Smart Connector for docking and an all-in-one Lightning slot for data and power. Cameras include an 8MP 1080p HD rear lens and a front-facing 1.2MP unit. Equipped with the new iOS9 operating system, the iPad Pro adds some new wrinkles to the familiar Apple mobile experience. There’s split-screen multitasking as well as a user-configured multi-tasking menu that can be accessed via a swipe down the right side. Pro-optimized apps include Paper, Adobe Comp and a new tool called uMake. All the usual free software such as Siri, FaceTime, Keynotes and GarageBand come as standard. The base Pro model comes with the expected 802.11 MIMO Wi-Fi as well as Bluetooth 4.2. If you want to take the show on the road, supported networks include HSPA+, GSM/EDGE, CDMA and LTE. With the release of the iPad Pro, Apple also released a keyboard accessory and a Pencil. There’s no other way to say it: The Pencil is by far the best Apple stylus so far. The ink immediately displays on the iPad Pro’s screen as you move across the display, with no perceivable delay or lag. Writing with competing devices often results in worse handwriting, thanks to a slight offset from where the tip of the stylus is, and where the digital ink ends up. With the Apple Pencil, where the tip is, so is your ink. As you can imagine, artists love it. You can charge the Pencil by removing its cap and plugging it directly into the Lightning port on the iPad Pro. It took roughly 30 minutes and 10% of the iPad Pro’s battery to charge the Pencil from zero battery to 100%. A new Smart Keyboard is also available. Thin keyboards for tablets have come on leaps and bounds. 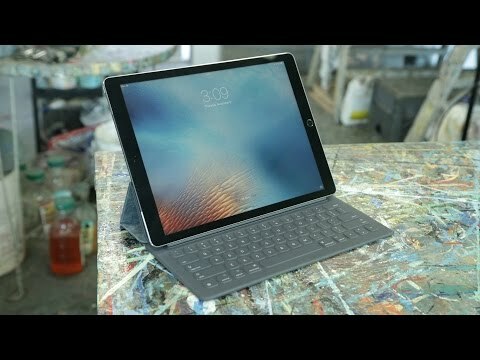 The iPad Pro’s keyboard rivals the Microsoft Surface Pro 4’s. The biggest difference is the lack of a touchpad; meaning you’ll be leaning over to tap the screen all the time. Covered in a tough fabric, which makes it robust and water-resistant, the keyboard also serves as a screen cover for the iPad Pro. It’s a full-sized offering, with appropriately low keys that help keep the iPad Pro looking supermodel thin. There’s still plenty of room to know when you’ve hit a key, and they’re large enough and spread enough to make accurate typing so easy. Unsurprisingly, the iPad Pro is every bit as responsive as its forebears when it comes to multi-tasking and general interactivity. Preliminary benchmarks show that the Pro can rival many laptops insofar as raw computing power is concerned. It scores in the 63,000 range on AnTuTu and roughly 5,500 on GeekBench 3. Under average conditions, battery life should clock in at 10 hours or so. First off, the all-new iPad Pro delivers the computing power of an entry-level laptop in a compact package. The display is the best that Apple’s put out yet and the speakers are truly amazing. Lastly, the software ecosystem available to iPad Pro users is better than ever. The only real downsides are price and size: this model isn’t cheap and it’s massive compared to the iPad Air. If you haven’t owned at least one iPad at this stage of the game, you probably don’t want one. The iPad Pro will keep Apple loyalists more than happy and can double as a laptop replacement with a Smart Dock. If you want a versatile computing device that can function as a PC, a TV or a sketchpad, the iPad Pro fits the bill. From Matthew at Techcrunch, talking to his father. They start discussing how to use it to make art, then move on to other features. I thought it was pretty interesting and different from the normal review video.